Facts about Black Bar Chromis fish. "Scientific name for Black Bar Chromis fish is Chromis retrofasciata". Black Bar Chromis is a Chromis variety of fish that comes from the Pomacentridae family. The Black Bar Chromis fish varieties are native to Indonesia, and rarely make their way into the aquarium business. 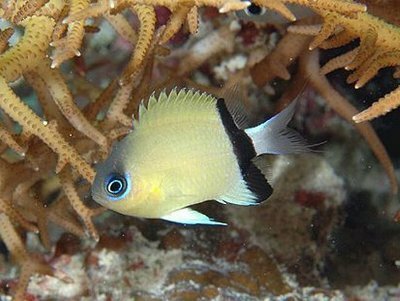 The Black Bar Chromis fish are found at a depth, ranging from 16 to 210 feet (5 to 65 meters) and they live in outer coral reefs and lagoons. When developed in an aquarium, the Black Bar Chromis fish varieties prefer an abundance of live rock to hide in. They prefer to be in clusters of minimum number of six fish and they are normally a passive species, except they are accommodated alone. This fish variety is the easiest among all sea fish to maintain. When kept in an aquarium, the Black Bar Chromis fish breeds prefer a tank with a minimum capacity of 30 gallons (114 liters), with the temperature of the water, ranging from 72 to 78 degree Fahrenheit (22 to 25 cel), with the water pH levels between 8.1 and 8.4. When matured, the small, nonviolent Black Bar Chromis fish breed is capable of attaining a maximum body length of 2 inches (5 cm). The Black Bar Chromis fish breeds are usually seen within a branching coral head, with brown to yellow color body and a unique perpendicular black-colored bar where the body and the tail meet. Black Bar Chromis fish breeds are omnivores, and in the aquarium, they are fed with vegetable and flesh based foods. To keep them healthy, they are also fed with frozen Mysis and vitamin-rich brine shrimp and a high-quality flake food. Though these fish varieties have to be fed several times a day in the aquarium setting, they do not actually required to be fed frequently in the reef setting. Similar to all fish varieties in the family, damselfish, Black Bar Chromis fish breeds can be territorial and violent, particularly when they get older. They have to be maintained together with their own species and with other bigger fish, but the Black Bar Chromis fish have to be observed closely to ensure that their violence does not turn out to be destructive. The average lifespan of the Black Bar Chromis fish breed is 5 years in captivity.